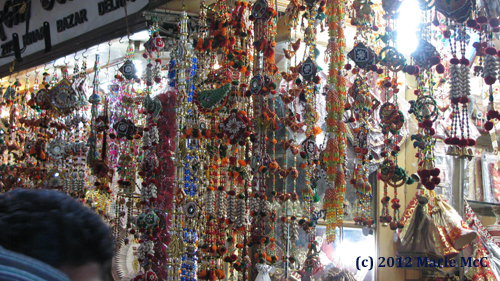 Chandni Chowk in Old Delhi was every bit as crowded, crazy and fun as I expected. 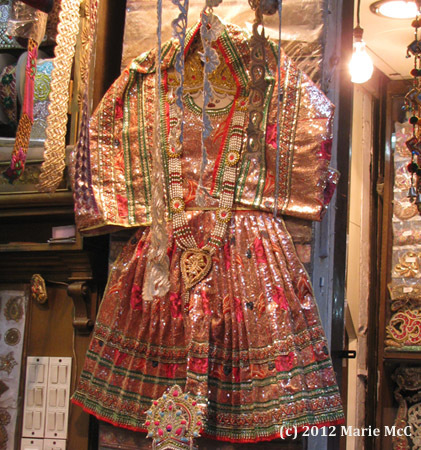 We stayed in the rickshaw except for one stop to see Naughara Gali, which is the subject of the next post. 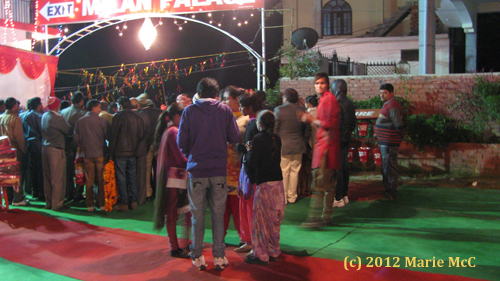 This is Dariba Kalan, the wedding street. Everything here is wedding related. I immediately noticed how skewed the ratio of men to women was. There were almost all male pedestrians here. This is a wedding street, for heavens sake! Where are the women? There were lots of intriguing things for sale. I really should have gotten one of these! Actually, I believe this is the equivalent of a man’s wedding tuxedo. But in the U.S., no one would know! In the U.S., men generally don’t care for shopping, let alone wedding planning. In my country, a wedding shopping street would be dominated by women, and men would be running screaming from the place! It made me smile to see men making wedding arrangements here. 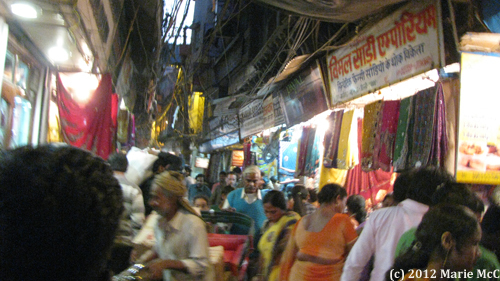 Turning onto the street where wedding saris were sold, it got even more crowded. There were a few more women here, but still not many. 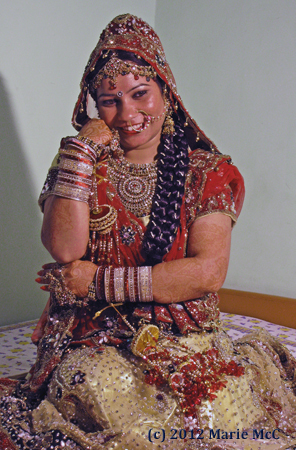 Traditionally, Indian women don’t wear white wedding dresses. They like color and sparkle. Red seems to be one of the most favored colors for wedding dresses. 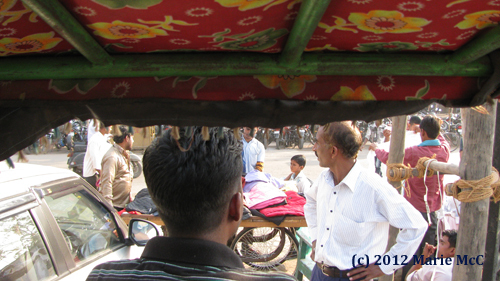 The streets were so crowded, Mr. Kalu had to get off and walk the rickshaw through in a few places. It was a bumpy ride which made getting good pictures challenging. 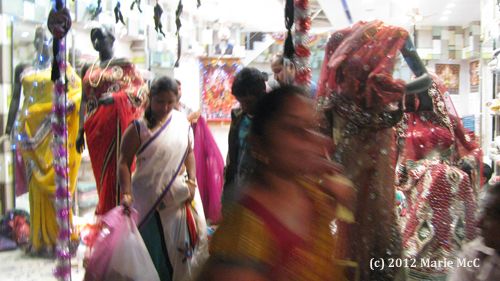 Any time he stopped — like right in front of this young man’s sari shop — was when I had a chance to get unblurry shots, but I had to be quick. 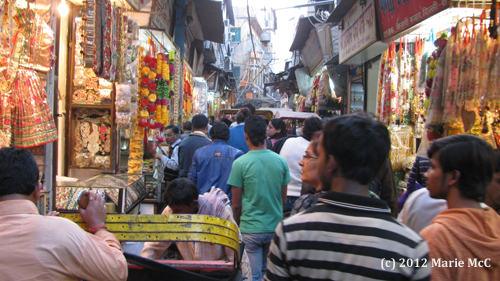 Now that I’ve had a taste of Chandni Chowk by rickshaw, next time I’d like to explore it on foot so I can stop at the food stalls. Prem arranged for his friend, Mr. Kalu, a rickshaw driver, to take us around Chandni Chowk, an insanely crowded neighborhood in Old Delhi. 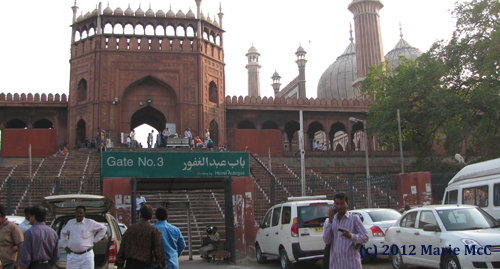 First stop was the Jama Masjid, which I hadn’t seen on the last trip. 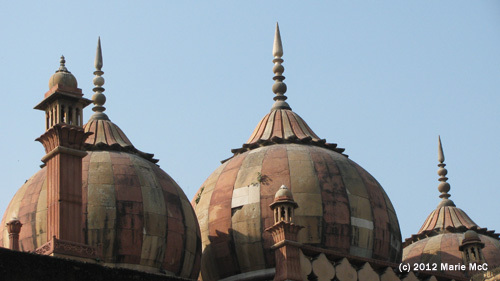 Delhi’s Jama Masjid is the largest mosque in India. 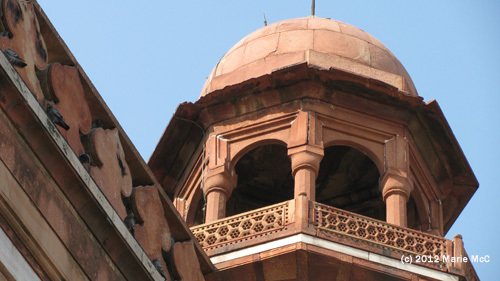 It was commissioned by Shah Jahan, who was responsible for the creation of the Taj Mahal and the Red Fort. It was nearly 4:00 p.m. when we arrived, which was prayer time. Only Muslims are allowed in at that time, so we waited at the top of the steps until prayers were over at 4:30. 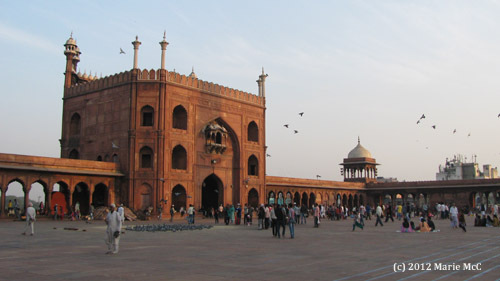 The courtyard can hold around 25,000 people. Shoes are left at the entrance outside. I was wearing slacks with a short sleeved shirt and was given a large long sleeved dress to wear over my clothes to cover my arms while I visited. I didn’t have a head scarf or veil but was not asked to cover my head. At the entrance they sold camera batteries and memory chips as well as guide books. 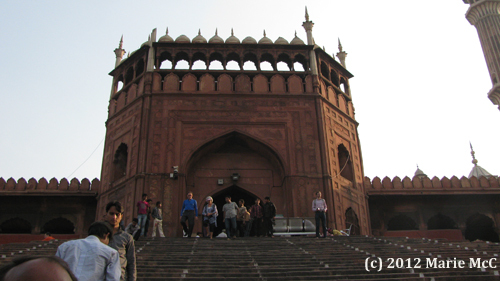 This entry was posted on January 28, 2013, in Delhi, India. 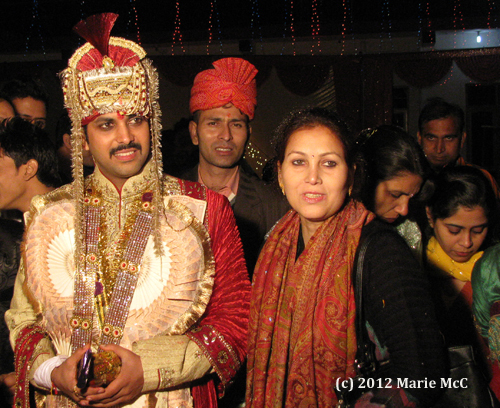 After Poonam’s wedding, Prem and I returned to Delhi where I booked a flight to Udaipur. 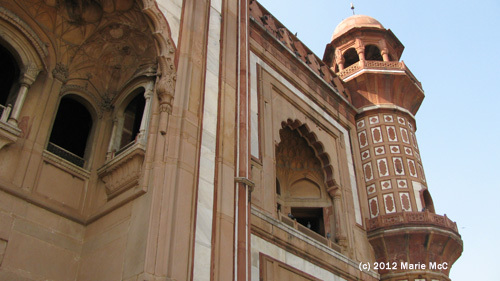 We had two days left in Delhi for sightseeing after a number of errands were done. 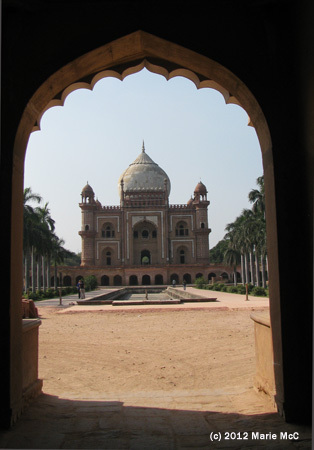 On my must see list was Safdarjung’s Tomb. 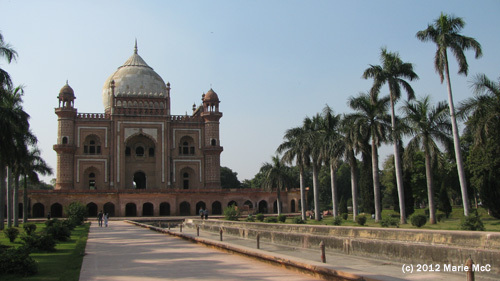 Born in Persia, Safdarjung was a powerful prime minister of a weak emperor. His son had the tomb built in 1754. 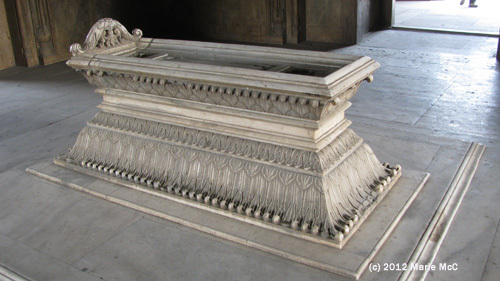 It is the last of the mughal garden tombs inspired by Humayun’s Tomb. 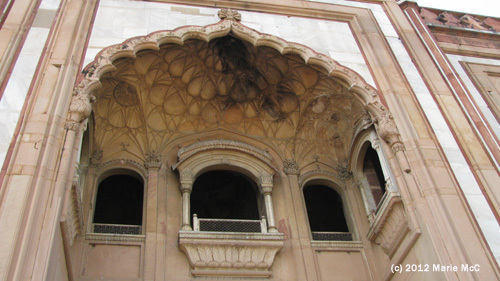 Safdarjung’s Tomb is not very popular with tourists, which I don’t understand. It’s a beautiful structure with nice gardens. What’s not to like? It was nice that it wasn’t swarming over with visitors, but it’s too bad that so few people come to enjoy it. I was glad I came. 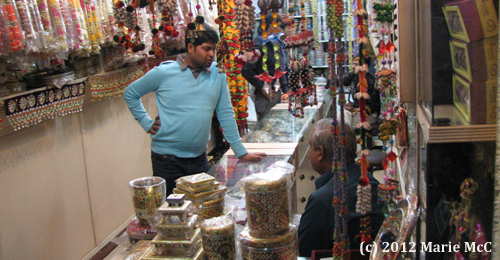 Some of the original inlaid semiprecious stones have been pried out and looted. We arrived at Ghumarwin just as the sun was setting. 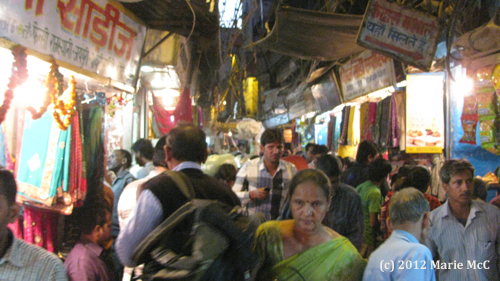 We had been invited to stay overnight at Poonam’s family home but thought there would be too much going on. We found a really cheap guest house instead on the other side of town. 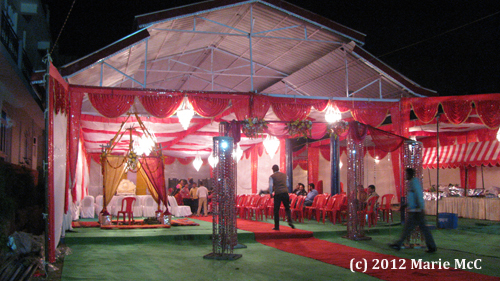 The wedding ceremony was held outdoors in a tent. 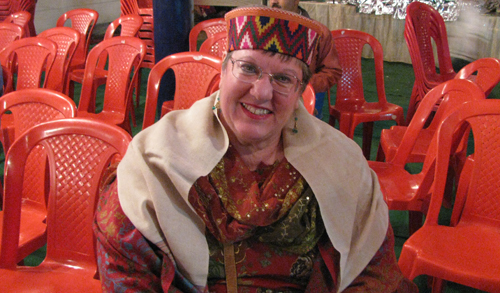 I was given a man’s Kullu cap on arrival. Lucky me! 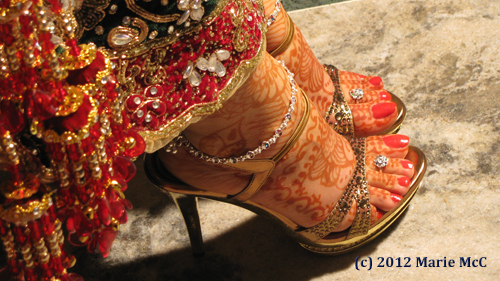 The wedding was supposed to begin at 8:30 p.m., but unfortunately the groom and his party — who were driving to Ghumarwin from Delhi — had been delayed in traffic. This was the night I was saved by socks. 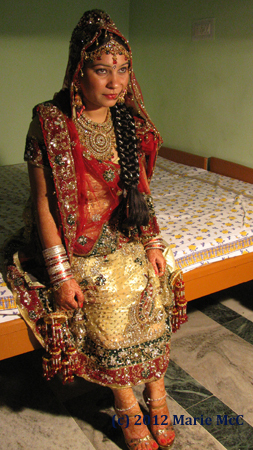 Poonam heard I had arrived and sent for me to join her in her room, where she was starting her photo shoot. I did a little photo shoot of my own. She was spectacular from head to toe. Literally. 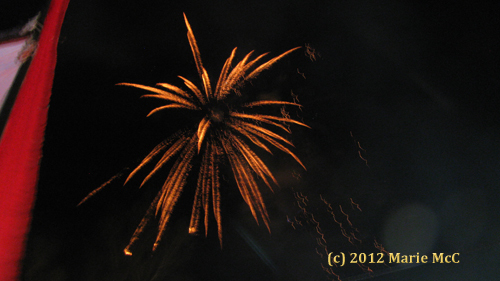 The groom’s arrival at 1:30 a.m. was heralded by fireworks. Trying to catch a glimpse of the groom. 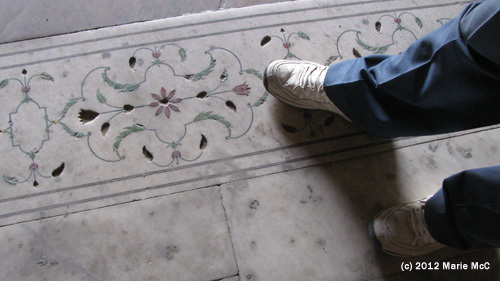 This entry was posted on January 21, 2013, in Himachal Pradesh, India.